had a decent day out with the s15 today out at Foresite Driver Training grounds in Vic. A great event run by SAU in a fantastic venue, good BBQ and a bunch of varied cars (well... mostly Nissans) and good drivers willing to have a chat or host a passenger lap. here's a short clip of one run in the S15. so a week ago i noticed that the s15 had very low oil pressure at idle - usually was 15-20psi, was down to 0-5 with the oil pressure gauge warning light going off. 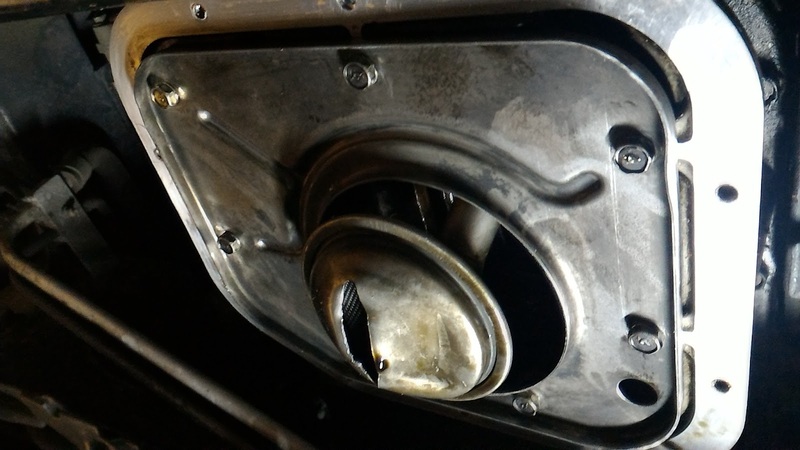 after a bit of research, seems the most likely case was that the oil sump/pan copped a knock, damaging the oil pickup which sits right at the bottom of the sump. 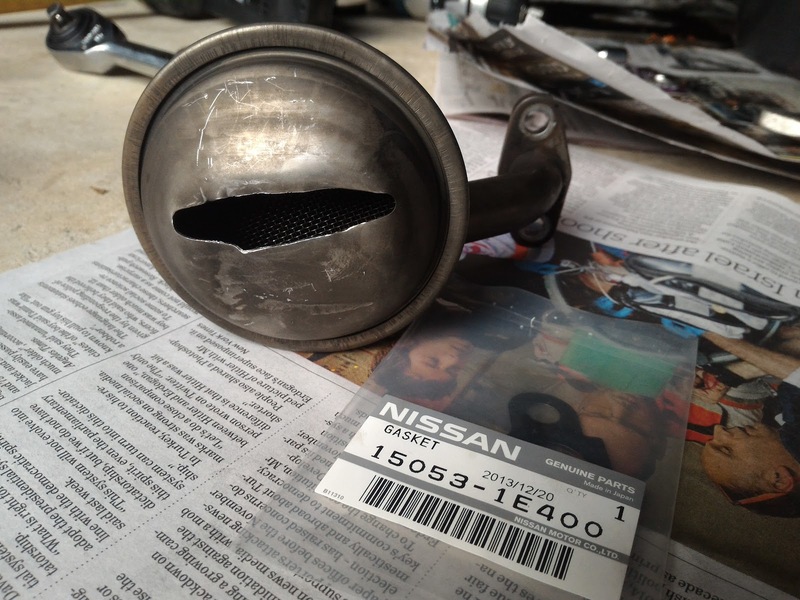 Other possible causes of low oil pressure can be a failing oil pump, or (worst case) worn bearings. anyway with the amount of off-road motorkhana/khanacross I'd been doing in a lowered S15 over the last few months, damage to the pickup was the most likely suspect. let's get fixing it... a brief diy. first, get your car up on ramps (or axle stands). as usual., never get under a car only supported by jacks! check out your oil pan. mine actually didn't look too bad, a couple of minor dents on the corners. 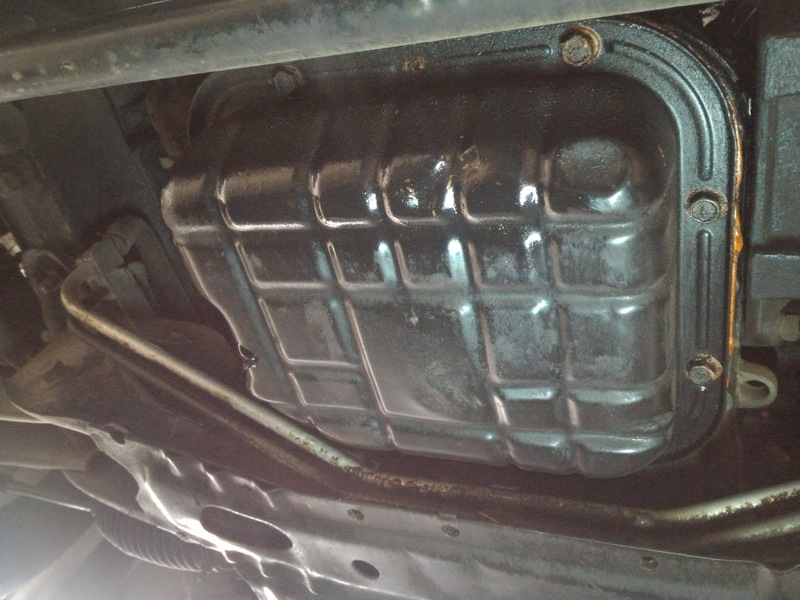 the oil pickup sits right where the larger rectangular flat area is in the middle of the sump. to drop the oil sump, I used a flat blade to cut away as much of the old sealant as possible, then got a paint scraper and gently wedged it around the pan. don't use a screwdriver or chisel to wedge the pan off - you'll bend the pan, or damage the upper oil pan, and both will cause you no end of grief with oil leaks after that. 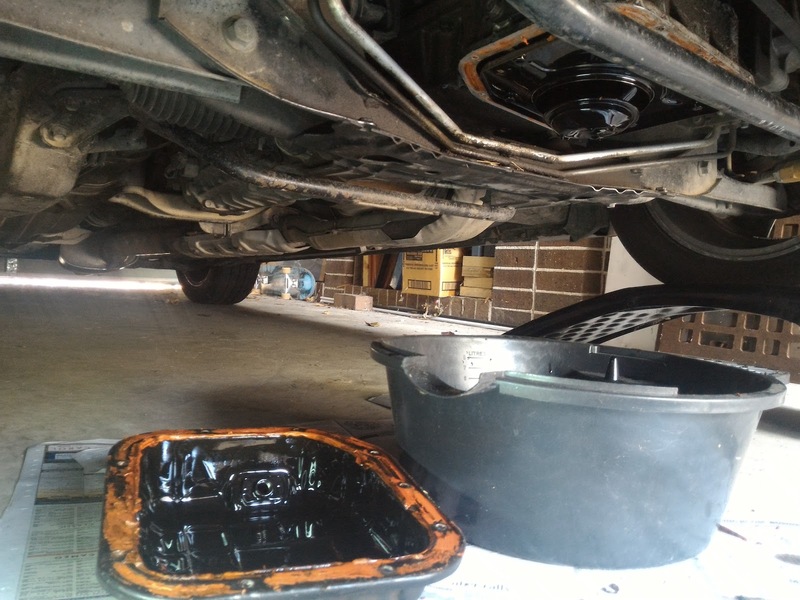 when you drop the pan, there will be about 300ml of oil still in the bottom of the sump, so be warned. 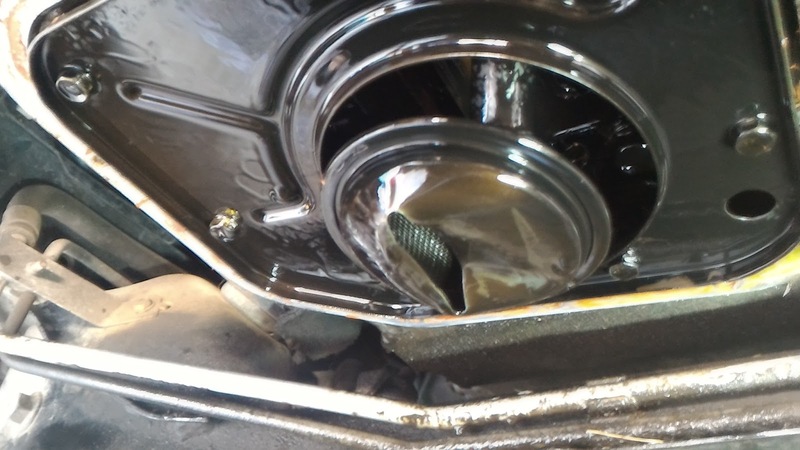 and here's the problem.... have a look at the oil pickup and you can see a massive dent in it, half of the oil strainer is blocked by the pickup. to get the pickup off, remove seven 10mm bolts from the windage pan, then a couple of big 12mm bolts holds the pickup tube and a 10mm socket to remove the support bracket bolt. gasket that came loose and stuck on the strainer. 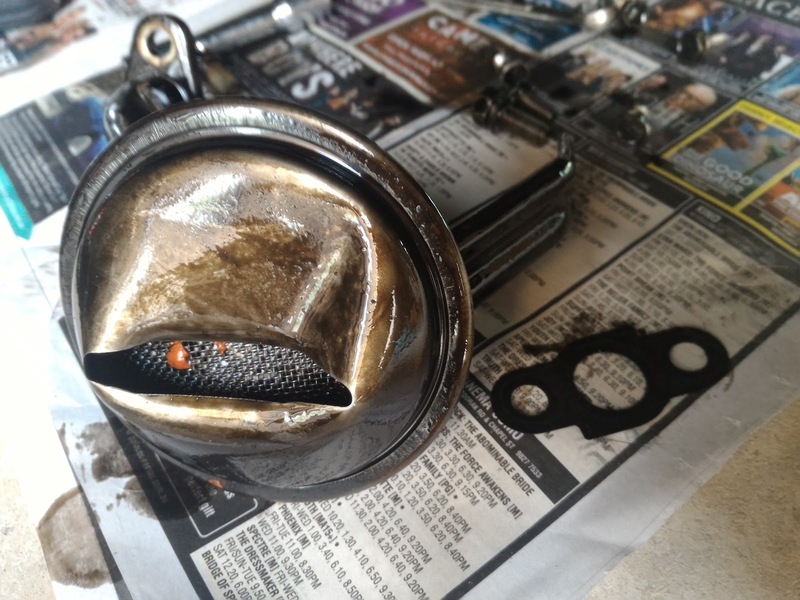 so after degreasing everything, i bent out the dent and checked the strainer which was in good shape, and remove all loose bits of old gasket. If the oil pickup is damaged or strainer has holes, i'd recommend a brand new replacement. Bought a new gasket for the oil pickup too, it's only $5. Resealed the oil sump with new high temp gasket, attached back to the upper oil pan. I let it sit overnight for the gasket to cure, then changed the oil filter, and refilled with about 3.8L of penrite HPR5 5-40. Took it for a long drive to check all pressure, stopping regularly to check oil levels and for leaks from the pan - no problems now, holds a good steady 15psi oil pressure at hot neutral idle.